His Eminence Minling Khenchen Rinpoche was born in 1970 and was recognized as the incarnation of Minling Khenchen Ngawang Khenrab Gyatso by Lhathog Rinpoche. 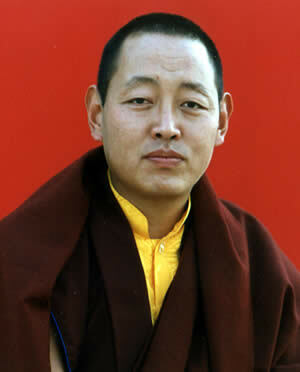 His Eminence Minling Khenchen Rinpoche has studied extensively with many various great teachers of the Nyingma Lineage. His Eminence Khenchen Rinpoche began his studies in Tibet with Khenpo Thoru Tsenam and continued on to learn from many other teachers including Venerable Dhagpo Rinpoche from whom he learned the arts of calligraphy, traditional recitation of texts, and the study of rituals. His Eminence Khenchen Rinpoche later studied for four years at the Ngagyur Nyingma Institute, the shedra of Palyul Namdrolling Monastery in South India. His Eminence Khenchen Rinpoche has received numerous transmissions and empowerments from Kyabje Dilgo Khyentse Rinpoche, Kyabje Penor Rinpoche, Kyabje Trulzhig Rinpoche and Kyabje Tsetrul Rinpoche. His Eminence Khenchen Rinpoche currently presides over the Shedra of Mindrolling, Ngagyur Nyingma College, in Mindrolling Monastery in Dehra Dun, India.